Carpeting | Belleville, IL - Collins Flooring AmericaWe have a new 800 number, but you can still call us at 618-234-2915 if you prefer. Nothing is as soft a treat for your feet as new carpeting. Whether you are trying to make your new house feel more like home, need softer floors because you’re growing your family, or simply want to update your space, we will help you find the carpet your feet will love. 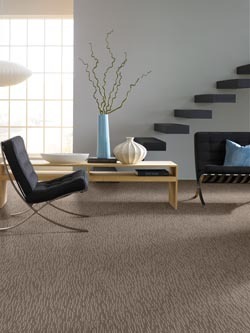 Come into our showroom in Swansea, IL and touch and feel the soft carpet samples. We carry carpet made from nylon, triexta, wool, new zealand wool, and polyester and will explore the best fiber for your home or business that will be the best quality to meet your needs. Once you find the carpet that will create the space you are dreaming of, you can check out samples to see in your home, in your lighting, with your furniture. We will then come out and do a free measure and find the perfect solution for your home and your budget. At Collins Flooring America, we know the best way to ensure our customers’ complete satisfaction is to get them exactly what they need and nothing less. We do this by providing an abundance of options regarding patterns, solid colors, tonals, flecks, and Berber carpet. However, rest assured we don’t just leave you to explore our vast inventory on your own. Our sales associates are always here to help. Our professionals take care to keep our showroom updated so it reflects current styles. New display from Nourison that features broadloom carpet up to 15 foot wide that can be installed in your home or made into a custom area rug. Beautiful designs, flat weave, textured, colors, shags, New Zealand wools and blends that are perfect to create the look you are dreaming of for your home. With 75 years in the flooring business and 3 generations of ownership, you can bet we know how to match our clients with their ideal floors in an easy and convenient manner. We wrap up our services with professional carpet installation work that offers you the most durable and beautiful end results possible. All Five-Star and Four-Star residential carpets carry a Confidence Plus Warranty. The timeframe of this warranty is 90 days after installation for Five-Star materials and 60 days after for Four-Star materials. If after you live on your new carpet for 30 days you wish to change your carpet for any reason, we replace it with another style or color of equal or lesser value. Should you wish to replace the carpet with an upgrade, you may do so by paying the difference in price. This is a one-time "design oops" replacement so you can rest easier with your choice. See one of our team members for details. At our carpet store, we believe in selling only the top flooring products to our customers—ones that last for years and match their requirements and preferences. That’s why we offer top-quality, industry-leading brands and explain the differences between them and the benefits of each. For instance, if you’re looking for something that’s spill- or stain-resistant, we recommend Resista®, Innovia Touch Xtreme Clean™, or Stainmaster®. Count on our contractors to ensure your new carpet looks great and lasts for years. We draw on decades of experience to ensure that each inch of carpeting is installed properly. Plus, we back up our services with a Lifetime Installation Guarantee for your security and peace of mind. This states that if the carpets you purchase from us ever have an installation-related issue, we’ll fix it at no cost to you. Our company is here not just to sell you carpet, but also to help keep it simply beautiful with our cleaning service, Collins MaxCare . We employ certified cleaning professionals to use the best processes, equipment, technologies, and solutions the industry has to offer. They know natural and synthetic fiber carpets and use non-toxic and pet-friendly methods for each of them. Routine cleanings from us improve your indoor air quality and help your floor last longer. Ask about joining our loyalty program to receive discounts and reminder calls when it’s time to clean. BND Reader’s Choice Awards voted us the #1 Carpet Cleaning Company, so you know we’re well-versed in carpet flooring and how to maintain it. Call us today to save time and energy. Contact us for the finest flooring around.We proudly serve homeowners in the communities of Swansea, IL and Belleville, Fairview Heights, O'Fallon, Shiloh, Mascoutah, Scott Air Force Base, Freeburg, Millstadt, Caseyville, Collinsville, Maryville, Glen Carbon, Smithton, Waterloo, and the surrounding Metro East community.